Cluelessly walking in museum space and looking at art works is frustrating. How can walking though museum space and looking at exhibit work be enhanced with a more holistic experience design? CMOA Band ties museum visit together for visitor effortlessly experience personalized visit through My CMOA Experience platform. Visitors are ables to easily plan ahead online to enjoy their time when arrive. CMOA Band provides three interactions: pause and play, save, comment and share provide navigation and allow you to save interest, share experience, and purchase goods. one watches two minutes of 3D museum exhibitions overview video, while saving one's interests by tapping the save icon on CMOA Band. One scans CMOA Band for identity recognition and ready to customize My CMOA Experience. CMOA system detects one's location with CMOA band and the EarPods plays the descriptions of the art piece. 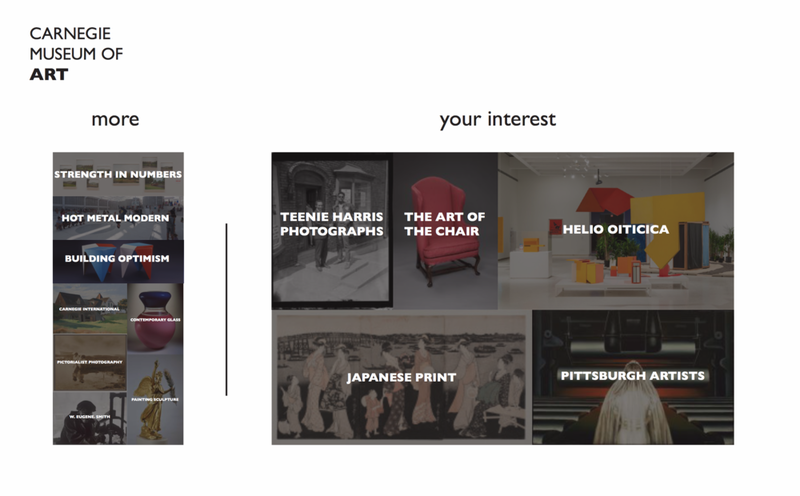 By tapping Save on CMOA Band, one saves the art piece to Favorites. One speaks to CMOA Band to shares thoughts on CMOA Share. One scans CMOA Band on on of many scanners in the museum to check customized route. When resting or curious, one scans CMOA Band to checkout CMOA Share on thoughts about art pieces. One finds out the art pieces that people are talking about. When leaving, one scans CMOA Band to connect My CMOA Experience and air drop saved Favorites to one's personal device. One purchases goods with CMOA Band.